Thank you Berkshire Taconic Foundation! It took me a few months to find the right guillotine. 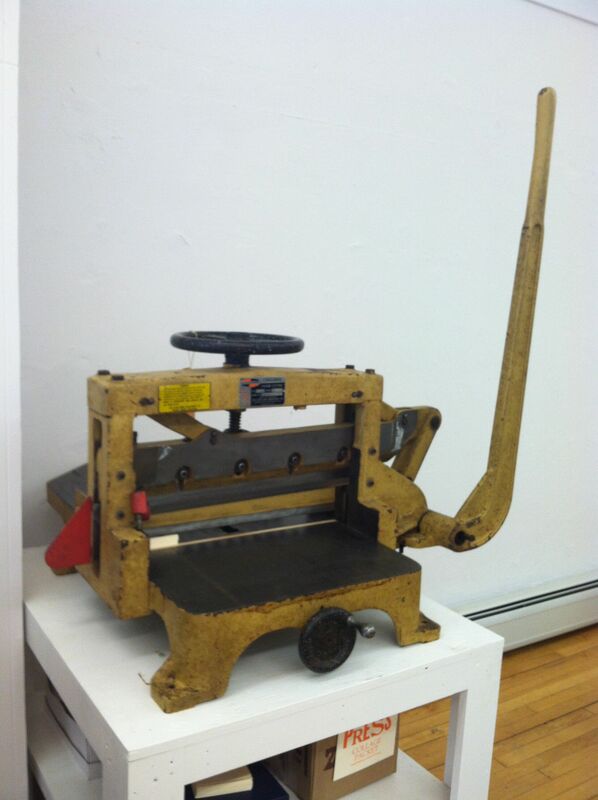 I called my friend John Barrett at Letterpress Things to have him be on the lookout for one that had good safety features, was big but not too big, and that wasn’t electric. I wanted old-school guillotine. Note the red safety trigger. Once it arrived at PRESS, I started cutting paper. Trimming a sixteenth of an inch off of a stack of 200 sheets just because I could. I squared up piles of paper, trimming hairs of first one side, than another and than another. I prepped paper for the prints for our upcoming exhibit in less than fifteen minutes. Not only were they perfectly square, each and everyone of them was the exact same size. Prior to the guillotine, I cut every piece of paper with a paper cutter–a decent one, but still, a long and arduous process when trimming hundreds of pieces of paper by hand. The guillotine will save time and will be a great thing to demonstrate to the different people who come to visit PRESS. Who doesn’t want to see paper cut like butter? Finally, the rubber based inks. They just arrived this week. Here I am opening up the boxes. It was like Christmas in June. They do not form a skim on the surface. When soy and oil based inks are exposed to air, they form a protective crust. You can prevent this with wax-paper sealers, but inevitably, especially in a shared space, air seeps in and then before you know it, you are tossing oodles of ink that has hardened. Rubber inks remain open longer. In a pinch, if you have to stop in the middle of a print run and not return until five, six or even ten hours later, everything will be fine. The inks will not harden on your rollers and still maintain their properties. Again, a great thing to have in a shared space. And because of the above two reasons, less waste! Thank you again! Looking forward to showing off the goods at our new location! Hope to see you there. Tags: Berkshire Taconic Foundation, John Barrett, Letterpress Things, Sedlock Carpentry, Tim Sedlock. Bookmark the permalink.